Prime Minister Sheikh Hasina today said education sector continued to receive highest budgetary allocation as her government envisages an educated nation for country’s advancement in all fronts, reports BSS. “The government allocates highest budget to education sector and took steps for diversification of the education to build up country’s huge population as human resources,” she said as she released the annual results of HSC and equivalent exams at a function at her Gonobhaban residence. The function marked the release of Higher Secondary Certificate (HSC), Alim HSC Vocational, HSC (Business Management) and Diploma in Business Studies (DIBS) examination results. Education Minister Nurul Islam Nahid handed her over a summary of the results while the examinations were held under eight general education boards, madrasa and technical education boards in April this year. Chairman of the 10 boards handed over the results of their respective boards to the premier. The prime minister said since assuming office in 2009 her government was making constant efforts to modernize the education system with a special emphasis on technical and science education. She said Bangladesh entered into an advanced scientific arena launching Bangabandhu Satellite and establishing nuclear power plants but the country now needed huge competent manpower for running the state of art installations. Sheikh Hasina said the incumbent government was working to make compatible the education system to world standard so the next generation could move keeping pace with other countries. The premier expressed her hope that new generation would devote them in studies taking the advantages of the government created facilities and groom them up as competent citizens. “Education is the best wealth of a person which none can take away (and) our children are undoubtedly meritorious, while we have to use their talents in nation building activities,” she said. The prime minister appreciated the efforts of the education boards, administration, law enforcement agencies to check question-paper leak this year. 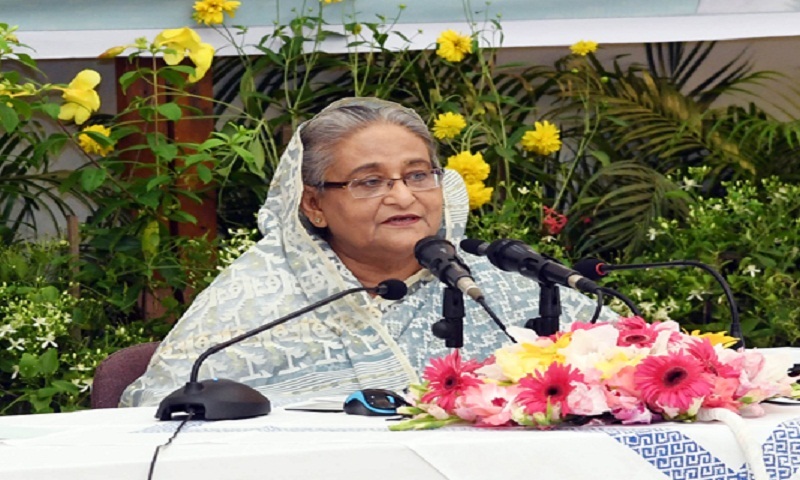 Sheikh Hasina said the post-1975 governments gave more attention to enjoy the power than delivering services to the people and for subsequent 21 years the countrymen were exposed to their misrule. She reiterated her call to guardians, teachers and religious leaders to take care of their children for their protection from militancy, terrorism and drug abuse. State Minister for Madrasa and Technical Education Division Kazi Keramat Ali and Secretary of the Higher Secondary Education Division Sohrab Hossain also spoke at the function, moderated by premier’s principal secretary Md. Nozibur Rahman.